Many people often assume that iodine deficiency problems are a thing of the past due to iodized salt, but this is absolutely not true. Some experts claim that 90% of the US population lacks sufficient iodine. Iodized salt is not a reliable source and even if is was, it does not contain near enough to provide optimal health. 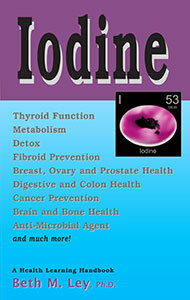 While most people associate low iodine with thyoid and goiter, Iodine deficiency can actually lead to the development of many adverse health conditions and symptoms because the entire body (i.e., all organ systems) depends upon iodine for the critical roles it plays energy production, healthy metabolism, digestion, and overall support of health. Iodine deficient humans suffer from physical, neurological, mental, immune and reproductive disease. Iodine is concentrated firstly in the thyroid tissue and after that mostly in reproductive tissue, such as the breasts and ovaries. Women are at higher risk for iodine deficiencies because of it. Estrogen and iodine actually compete with each other at receptor sites. In addition, today we have many iodine enemies known as halides. These include flouride, chlorine and bromides. Bromides are found in commercial breads, fruit juices and soda pop. Look for Brominated Vegetable Oil (BVO) on your labels... you will want to avoid these as they also compete with iodine. Some conditions associated with low iodine levels. Cancer - especially hormonally-related: breast, ovarian, prostate, etc.